With no matches at Dillington or Perry St this week I phoned Pete at Summerhayes to put my name down hoping it was going to be on Sellicks but of course it was on Longs. I have lost my way somewhat on this pond and just can’t seem to catch decent skimmers anymore. My favoured 4mm expander and micros approach is no longer effective due to lots of small fish so I’ve tried 6mm expanders which didn’t solve the problem and a banded hard 6mm pellet avoids the bits but I only seem to catch carp on them. Apparently people have been catching some decent skimbobs on meat so for today I had some 6mm cubes with me. I got to the venue in good time and there were all the usual faces plus quite a few I didn’t recognise, it was nice to catch up with Trevor Holmes who I hadn’t seen for ages. There were 27 anglers fishing today which is a really good turnout but I did think it might make the fishing a little tougher. Glynn Wickham pulled out number 37 again and wasn’t too happy as it’s a really good carp peg, there weren’t many balls left when I stuck my hand in the bucket and I was well pleased when I opened my fingers to reveal peg 34. 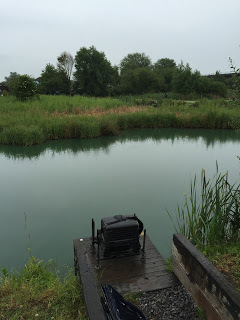 It’s a good silvers peg and Scotty had 15lb of crucians and tench in the mid week match on corn in the margins. For company I had Ray Wickham on my right and we seem to draw next to each other on this pond a lot and he gave me a right spanking last time out. I had an empty peg on my left which surely could only be a good thing and then Jess Jordon was on 36. I set up a 10 x 11 MW F1 Slim to fish two lines at 10 metres, one with groundbait and the other with micros, and a 0.4 gram Malman Pencil to fish the meat at five metres. On the whistle I cupped in half a pot of micros straight out in front and then two balls of groundbait angled to the left before putting in a few cubes of meat on the shorter line. I started with a 4mm expander over the micros and first put in had a roach of 6oz or so, I then had a small carp, followed by a blade and then a pound skimmer – a great start. But then I started missing quite a few bites which I’m sure were from small fish so I tried a cube of meat and the next bite resulted in a 3lb carp, which wasn’t what I wanted. I switched to the groundbait line but never had a bite over it. I’d been feeding the shorter line regularly with a few pieces of meat and tried it for the first time after an hour and a half. After five minutes or so the float sailed away and I missed it! In fact I missed around eight bites on the trot before I connected with a small carp. From what I could see, it was fishing really hard, Jess had a couple of carp and Glynn and Ray just had a few bits and bobs, the only person who seemed to be stringing a few fish together was Bill ‘The Paste King’ Hopping on peg 32. I was missing bite after bite on the meat and it was turning into a really frustrating day, losing several foulhooked fish didn’t help much either. By the half way point I had five or six carp and thought if I could get to fifteen it would give me around 30lb which I hoped might sneak into the top five if it was fishing as hard as bank walkers were saying. The missed bites on the meat continued and it was almost laughable, I did catch a roach and a small skimmer so maybe they were to blame? Jess was still getting the odd carp and there probably wasn’t much between us, Glynn had started catching small roach quite quickly and another pound looked to be heading his way. I ended up well short of my target with eleven carp and not for the first time this lake has really frustrated me. I packed up really disappointed with how my match had gone, especially after a decent start. 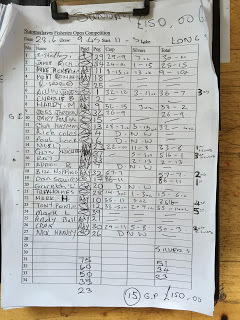 The scales started with Glynn and he had 5lb 1oz of silvers so I conceded the pound, Mark Leahy didn’t weigh in 39 before Alvin Jones had 36lb 7oz from peg 1, then the next few pegs DNW’d before Harry Muir had 33lb 2oz from peg 9, Mark Hanham went into second place with a level 36lb from peg 10 and then Tony P came close with 35lb 14oz from peg 12. Dan Squires in peg 17 then plonked a fantastic 86lb 11oz of carp on the scales to storm into the lead. Nigel Wickham had 11lb 8oz of silvers from peg 23 which put him top and the next few pegs chucked back. Craig in peg 30 weighed 5lb 8oz of silvers to push Glynn down a position before Bill ‘The Paste King’ went into second place overall with 57lb 7oz, Ray had 2lb 13oz of silvers before it was my turn and I knew I had nowhere near enough, my silvers weighed 1lb 15oz and my carp went 24lb, last but not least was Jess who had 26lb 9oz of carp. In hindsight (yes that wonderful thing), I probably should have fed an inside line with corn and a shallow rig with pellet would have caught a few carp as another four or five would have got me in the money but it’s the silvers I like fishing for and I have no clue how I’m going to fish for them next time. In other news, Jamie Parkhouse had yet another good result, this time with a win in the Chard Reservoir League today, he had 11 bream for 46lb 14oz from peg 28. Ah I was hoping for a dillington blog! Yeah, I think they'll prove popular with most but maybe would have been nice if they were crucians and tench instead, but no doubt they would be more costly. I agree mate, think F1's will just be a nuisance!